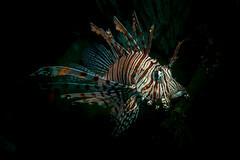 The Lion Fish is often killed by dive guides for being an invasive species, typically in the Caribbean and Mexico. It has a reputation for being one of the top predators in the food chain, and clearly adapts easily to new locations. This photo was taken in Sri Lanka at 52m, in the Lion Fish's natural territory.